Butterfly braids are a beautiful, protective style. 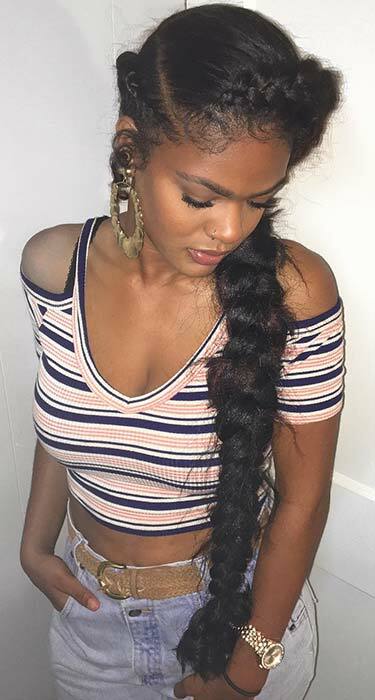 These gorgeous braids have become one of the hottest hairstyles to try because they look amazing and don’t require a lot of maintenance. 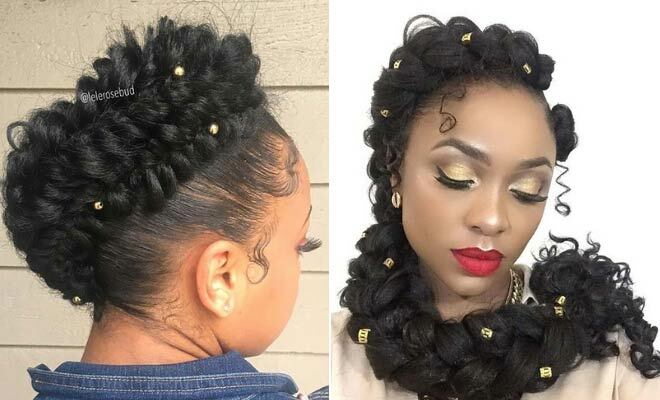 We love these braids and have put together 23 of the best hair ideas on Instagram. You will find stunning braids that you can wear anywhere from a party to a formal event like a wedding. There is a hairstyle to suit everyone! The first hair idea we want to show you is this beautiful butterfly braid updo. The braids have been styled on top of the head to create a trendy faux mohawk hairstyle. You can also see chic gold beads which really give the updo a glam look. Hair like this would be perfect for a special occasion and for the holiday season. Our next idea is this trendy braided hairstyle. We love these braids because they are sleek and create a stylish, statement look. 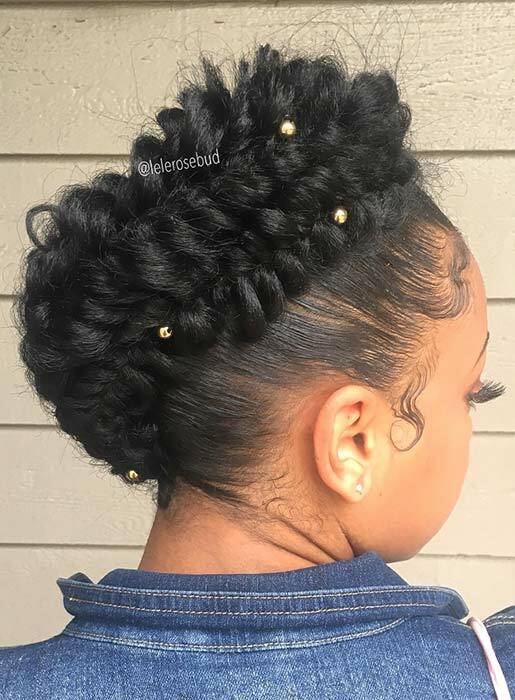 When recreating a hairstyle like this, keep the braids thick but the ponytail can be any length. 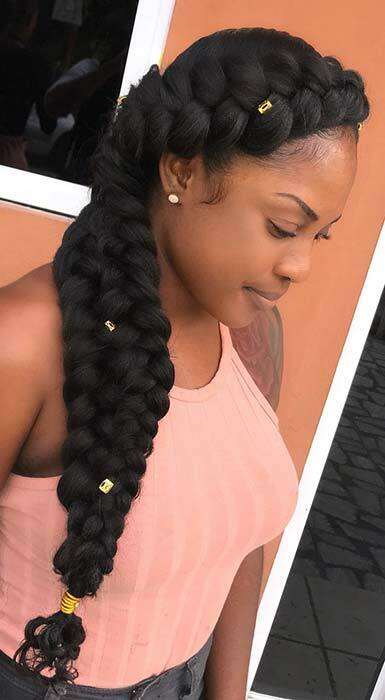 Braids like these are versatile and can be worn for any occasion. Looking for a glam butterfly braid hairstyle? Then this idea is perfect. These butterfly braids feature a long, thick and beautiful braid with a smaller side braid. The hair has also been accessorized with hair cuffs too. This is a stunning idea that would be perfect for the holiday season. Butterfly braids can be left in a single braid once the two braids have met, but they can also be styled into other ways too. Here we have a couple of beautiful ways to style butterfly braids. As you can see, one has the classic ponytail look while the other has been put into a bun. You can wear the first style during the day and glam up your look for special occasion with the bun. Next, we have a long braided look. The hair has been styled into the two braids that then meet in a very long butterfly braid ponytail. We love how the braid is more relaxed than some of the sleeker styles as it gives the hair a trendy, boho look. To achieve this style, you will want to pull the braids out quite a lot when creating the butterfly effect. Generally butterfly braided looks feature two braids that meet and then blend together. This hairstyle is a little different. 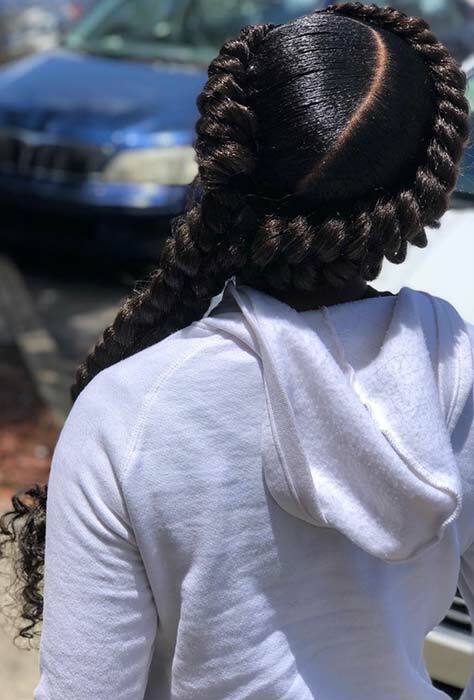 Here we have braids that start and end as two separate braids, but they still have that stylish pulled out butterfly look. This is a gorgeous hair idea that is great for the women who like to stand out from the crowd. 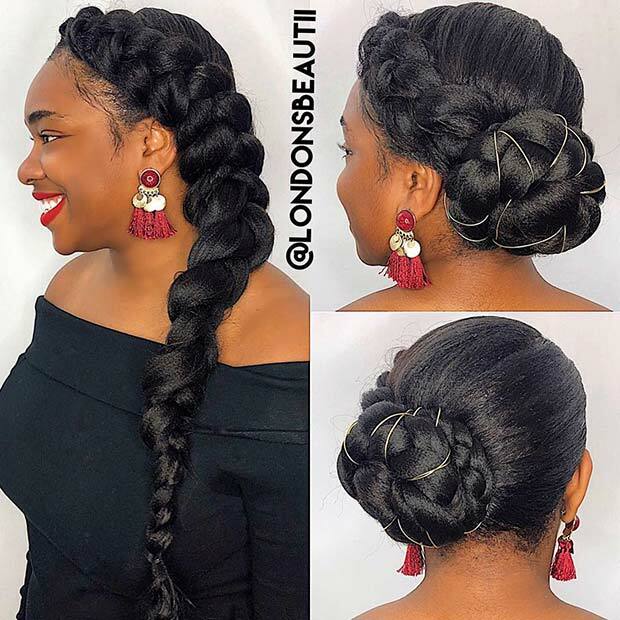 You can make your hairstyle unique and express your own individual style by adding accessories to your braids. 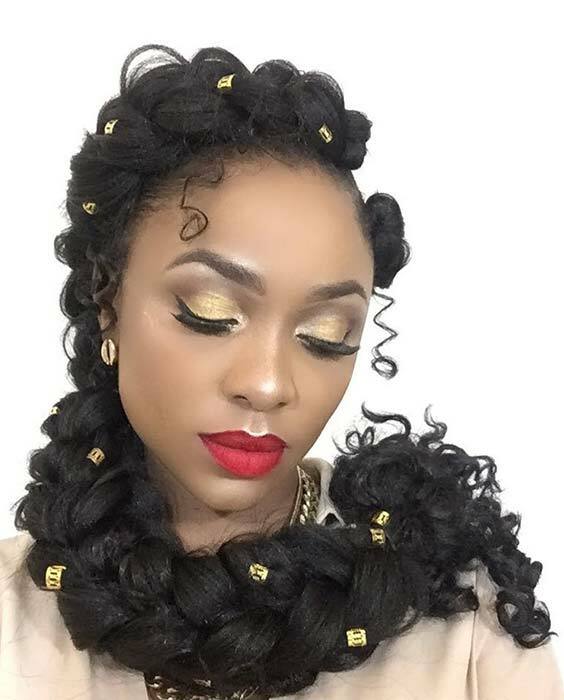 These braids are a super stylish example. The chunky butterfly braids meet in the middle and end in one, sleek single braid. Then the look is finished off with a gold cord. As you can see, the gold really jazzes up the hairstyle. You can use any cord, in any color. If you love bold hairstyles, this next idea is for you. Here we have butterfly braids in a vibrant, red shade. 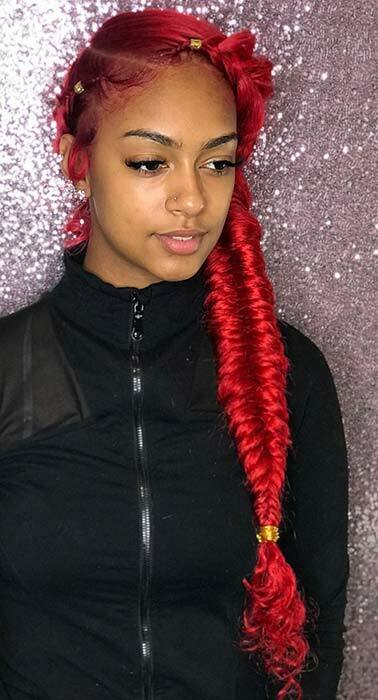 As you can see, the red and the braids look amazing together! You can recreate this red look or you can use a different color. If the bright tones are not for you, try a dark color like burgundy. Next, we have a stunning halo braid to show you. Halo braids frame the face beautifully and look very glamorous. This halo braid features thick braids with a red tone running through them. 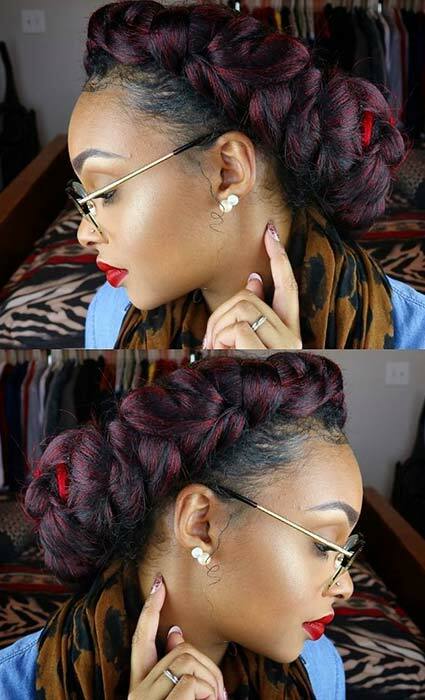 A red color like this is perfect for Christmas and halo braids are perfect for parties and formal events. This next hairstyle is one of our favorites! 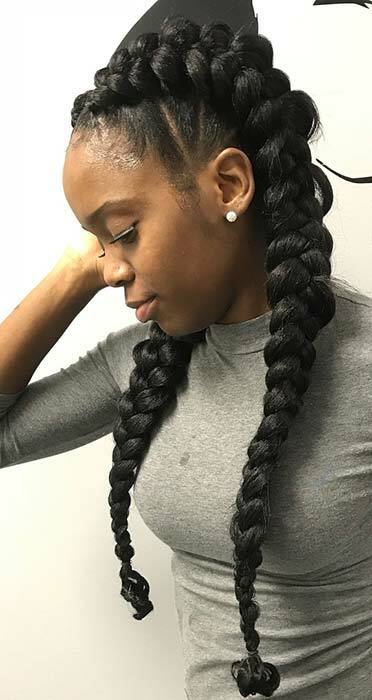 This stunning look features chunky butterfly braids and instead of the braids blending into one, the two are put together to create one large ponytail braid. This way you get the detail of both braids. Also, the ponytail looks intricate and it has a lot more volume too. Recreate this look or try the hairstyle without the accessories.